Living in a polluted planet, allergy is a common health issue these days that most people are suffering from. How painful allergic reaction can be only an allergic patient knows. According to a research of 2012 conducted by the American Academy of Asthma and Immunology, more than 11 million people receive allergic treatments in the US. At present, the situation got worse. But, why does allergy happen? Well, allergy is related to our immune system. Our atmosphere is filled with pollutants like dust, dirt, mold, pollen, pet hair, dander, chemical particles and so on. The allergens live in the pollutants and when we inhale the germs get inside through our nose. The pollutants release chemicals and result in attacking the lungs. When the immune system is weak, the pollutants trigger problems like allergy, asthma, breathing problem, and sneezing, coughing, fever and so on. In most cases, allergies occur due to seasonal change, but if you are suffering from allergies and asthma problem throughout the year then it’s a matter of concern. So, how do you fight them? Read the following tips to know how to get rid of allergies effectively. 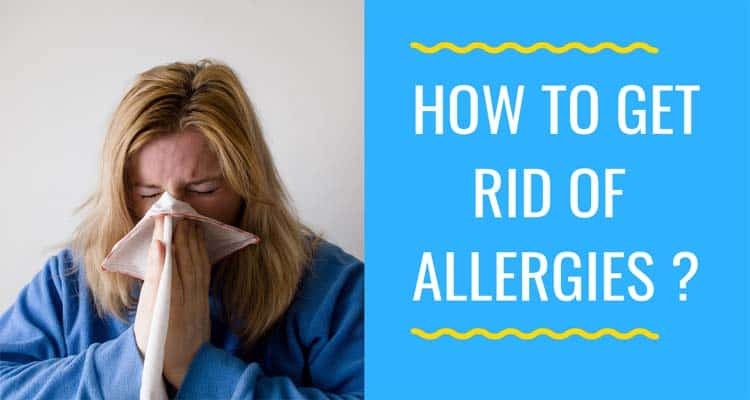 Even though it takes a lot of medication to completely cure allergies, with some simple home remedies you can effectively remove allergies from your house. So, if you are looking for simple yet effective remedies to fight allergic reaction, keep reading the following section! If you are allergic to pet lover but allergic to pet hair and dander, then you can hardly do anything about it. You may not live without your pet, but take some preventive measures to protect yourself. For example, bathing helps to minimize shedding of pet hair. You can give your dog or cat a good bath once a week. Also, you can trim down the hair if too long. When we are allergic to dust, cleaning is the first thing most of us do. But, how often do you clean the house? Also, while cleaning you need to focus on the area that absorbs dust, mites, mold, pollen, and similar pollutants. Here are a few tips that you can consider while cleaning the house. Carpets, bed, sofa, and fabric-based furniture catch more dirt compared to all other areas. They are also difficult to clean every day. Thus, you can cover such furniture and remove carpets to minimize the dust existence. Use a vacuum cleaner once a week. HEPA filter based vacuum cleaner is effective to remove airborne pollutants. So, you can use the device to pull out the dust, dirt, mites, and pollen from the carpet, sofa and other similar furniture. Molds are formed in moist areas like a bathroom shower, wall, cupboard, basement etc. Make sure these places are dry during rainy or winter season. You can also install a dehumidifier where you see the existence of molds more often. Control insects in the house. Insects thrive in rotten food and wet furniture. So, make sure the leftover foods are thrown out in the dustbin. Also, don't keep the wet clothes in the cupboard. More importantly, try to remove all the garbage regularly. You can either use insect killer to keep your house insect free but be careful about reaching it to the children. It’s a traditional but an effective way to deal with asthma. If you have dust allergies, planting butterbur at home might be beneficial for you. Research shows it’s a helpful herb that is a natural remedy for pollen oriented allergies. But, keep in mind that the butterbur is not medication for allergies. Staying in a clean and tidy house is a must, but breathing a clean air is even more crucial. Trust me even if you clean the house regularly, you cannot remove the pollutants from the atmosphere. Dusting or vacuum cleaning may reduce the existence of pollutants to some extent, however, a while after cleaning you will find dirt and dust over tabletop or kitchen cabinet top. Here, an air purifier can ensure your house is pollutant free. There are thousands of air purifiers available on the market. Each comes with special features that are effective to deal with mold and pollen, pet hair and dander, smoke odor and so on. Research also shows a HEPA air purifier can remove 99.97% of airborne pollutants from the indoor atmosphere. So, with an air purifier, you can ensure complete removal of allergy-causing elements from the house. You can also use the device at home, office, car and any indoor space. But, before you purchase one, make sure the purifier is certified by the Asthma and Allergy Foundation of America, and it has all the necessary features you require. With the above-mentioned tips, you can reduce and limit the existence of allergy-causing components from the house. But, you are already suffering from allergies; you must be looking for quick remedies. Here are a few natural remedies we suggest you try. If you are caught by seasonal allergies and dealing with sneezing, sore throat and fever, honey can give you ease your sufferings. You can sip a spoon of honey, mix honey with warm water or drink honey tea. Any of these are beneficial to give your throat a comfort. Actually, honey contains anti-viral elements to deal with allergies. Before you purchase to make sure its pure honey otherwise you won't get the desired outcome. Turmeric is a natural antioxidant. It helps to deal with wounds and skin allergies. They are effective for sinus and cold problems too. So, you can include honey in your food or drink turmeric milk for fast recovery. Get steam or menthol steam to recover suffocation and clogged nose. You can get a steamer or take a bowl of warm water, cover your head with a tower and get the steam. Drink chamomile or lemon ginger tea to recover from cold allergies, seasonal fever or coughing. Even though you cannot completely get rid of allergies with the allergy removal tips and remedies, at least you can reduce the symptoms. If maintained properly and regularly, you can minimize the allergy-causing components in the house. You can get an air purifier to lessen the cleaning hassle and ensure the clean breathable air in an indoor atmosphere. Since allergies are the health-related problem, we suggest you check what triggers your allergy at first. Based on your allergy type, you can decide if natural remedies or medical treatment would be helpful for you.